World confess, batik has high art value. With natural coloration, the art value also has separate flavor. Batik is one of properties of culture that is still everlasting. Batik masterpiece looks nice assortedly its(the type and motif. Now, batik devotee from outside country is more is alive to batik coloured with nature fibres. Natural color becomes primary source from ruddling, blue, and yellows. Expertise of hereditary of the peracik colour during for centuries is one of form of nuance expression and tint. pembatic Expertise excelsior and experience, increasingly increases also tint spread yielded. Hendri Suprapto, Consultant of Natural Dyes BIXA Batik Natural Colours, clearly explains coloration excellence of nature coming from birch soga. " Batik with contrast natural color will be looked into, felt cold, and makes healthy eye cornea," said Hendri. 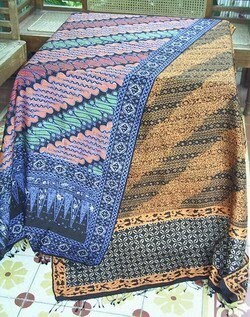 Batiks with natural color, like blue, soga, red, green, violet, and yellows has become batik symbol keraton. Forming of natural color happened through dialektika nature growth. Colours yielded from natural processs tended to menampilakan supple impression, soft, and will not yield tint that is precisely same even applies the same recipe. Besides soga, plant type for nature colourant is gambir, tea plant, and comedy meeting as cacao colour producer. Root mengkudu to yield ruddling, and crop type indigofera for blue colour. " Soil type also will influence level of colour durability. For example just of plant secang planted in Java soil;land;ground and Bali will yield colour merah-coklat which bebeda," explains Hendri. Along technology progress, since the year 1910, starts emerging syntetic staining technique. This colourant type applies material indigosol, bases, procion, indanthreen, and naphtol, so that colour seems to be sharply, bright, and salient. One of impact of syntetic colourant, 90% will destroy epidermis cells, causing becomes skin neoplastic disease cause. Natural color batik enthusiast is enthused [by] turis foreign countries. Batik consumer writes with natural color 75% is turis Japan. Mam Kato, an actor from Japan express their interest at natural color batiks, especially batik Keraton Jogja and Solo. " World campaigns for back to nature or returns to nature," he said. Natural color visit, the pembatic from Desa Giriloyo, Wukirsari, Imogiri Bantul, still commit with coloration of nature. The pembatic merged into by this Handarbeni batik society more esteemingly is coloration of batik by using element of nature, which later will yield colours elegan and high goal. This society formed at pascagempa 27 Mays then. Mas Nur Ahmadi, society associate Handarbeni lays open, forming of this batik society becomes one of effort to hearten the pembatic of Wukirsari. " 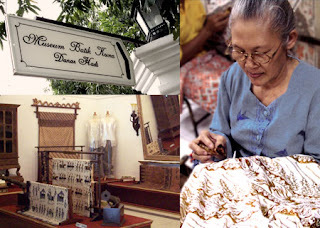 That be pembatic still esteem ancestors heritage, and many the rising generations which will learn batik," says Nur.